The group were taken on a revealing tour through the damp woodlands of High Park in search of mushrooms (the only part of the fungus which is visible), with Kami offering practical tips on field identification. The artistic aim this week was to accurately portray textures using all the drawing methods learned up to this point. 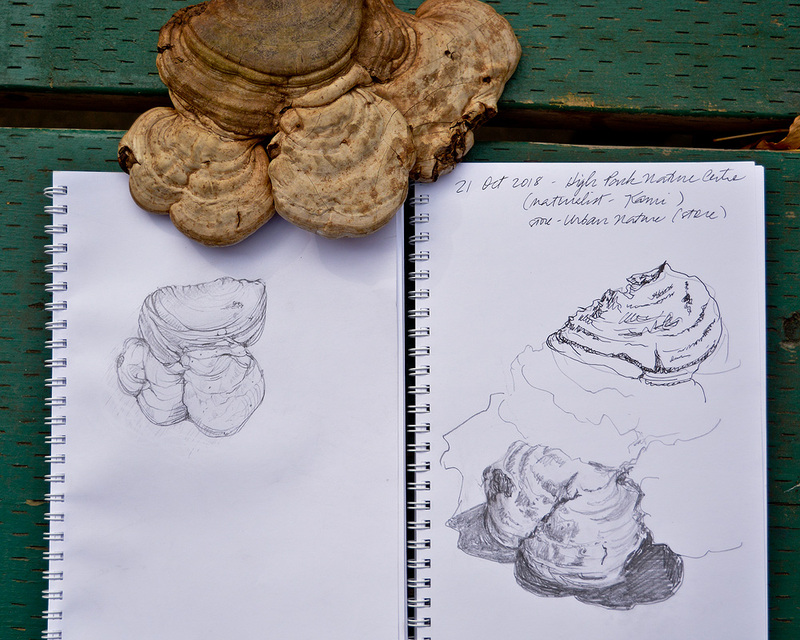 The students practiced making life sized sketches directly from preserved specimens that Kami brought the Nature Centre..
After successfully working from the specimens, we trekked into the woods and spent the latter part of the class field sketching mushrooms growing on fallen logs. Part of the fun was looking for them - when you slow down and peer around a moss covered stump, you just never know what you’ll stumble across. It’s like finding tiny gems. Thank you Kami Valkova for putting the “Fun” into fungus! Everyone made terrific sketches and we all left the class with a new love for these small wonders!